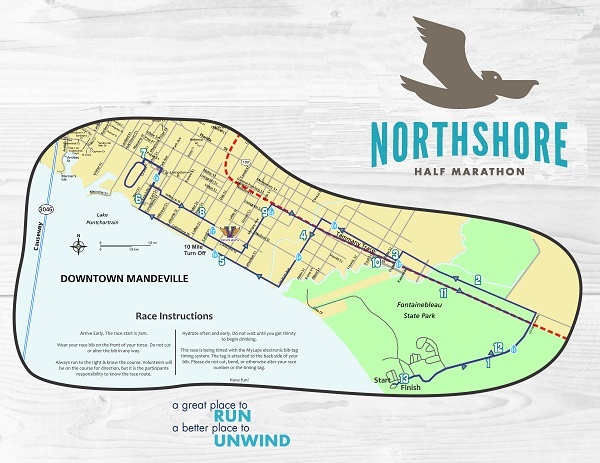 The Northshore Half Marathon & 10 Miler will offer multiple separate times & locations to pick up your packet. This way if you plan to drive in on race morning you will already be ready to race! Entry fees are NON-REFUNDABLE. Sorry, no exceptions. Once we receive and accept your entry, you will not receive a refund if you cannot participate. Acts of God or man that prevent the event from taking place will not result in a refund. You may not give or sell your number to anyone else. Should you be unable to participate due to injury or illness you can defer your entry to another Northshore Half Marathon in the next 12 months up to 14 days before the event for a deferral fee of $25. Email info@northshorehalfmarathon.com for info. Participants must present a government issued ID to pick up race packet. Presenting a copy of the Drivers License of the runner for which proxy pick up is being done is all that is needed. There are no exceptions to this rule. If you wish to have your packet picked up by proxy a copy of your drivers license must be presented. You must be 18 years or older to proxy pick up for another runner. There is plenty of free parking within Fontainebleau State Park. The $2 entry fee to the park is included in entry to the event. Simply follow the parking attendants & signs for parking. If guests arrive after the race has started please be prepared to pay park entrance fee. It is suggested to arrive no later than 1 hr before race. There is a 4 hour course limit to complete the half marathon race (~18:00/mile pace) If you are unable to continue at this pace you will be helped into the SAG wagon and will be transported to the finish line. The SAG wagon will only leave after the last runner has crossed the starting line and will proceed at ~18:00/mile according to chip/tag electronic timing. The Northshore Half Marathon & 10 Miler on the Louisiana Northshore will feature Mile Markers at every mile and 12 well-supported water stations. The Northshore Half Marathon is looking for a team of dedicated volunteers to assist in helping make the race this year a success. Are you part of a charitable organization? We have volunteer fundraising opportunities for groups such as schools, clubs, churches and other not-for-profit organizations. Contact us at info@northshorehalfmarathon.com to get involved! Imagine running 13.1 miles under mammoth moss covered oaks, past historic homes and along Lakeshore Drive as the sun sparkles across the water. Historic Old Mandeville, just a quick drive from New Orleans, features a course that is flat, fast, and guaranteed to provide the perfect place to kick off your fall racing schedule. View Northshore Half Marathon on the Louisiana Northshore in a larger map. This is a walker friendly course with a ~18/min per Mile pace cut off time. Finish line will stay open for 4 hours. A sag wagon will be following the course at that pace. The post-race party will take place on the parade grounds directly in between the park pavillions. Starting at around 8:15am, participants will be treated to some top shelf grub, Abita beer, and other assorted goodies. Awards will be awarded 3 deep in each of the below age group for both males and females. Please note that all age group awards are based on chip/tag time, NOT gun time. There is plenty of free parking within Fontainebleau State Park. The $2 entry fee for participants to the park prior to the race is included in entry to the event. If guests arrive after the race has started please be prepared to pay park entrance fee. How far is St, Tammany Parish from major cities in the South? When this page loaded, the official time was 8:26:56 AM EDT.